Miriam Quiambao, 43, is going to be a mom anytime now. She is 35 weeks pregnant. 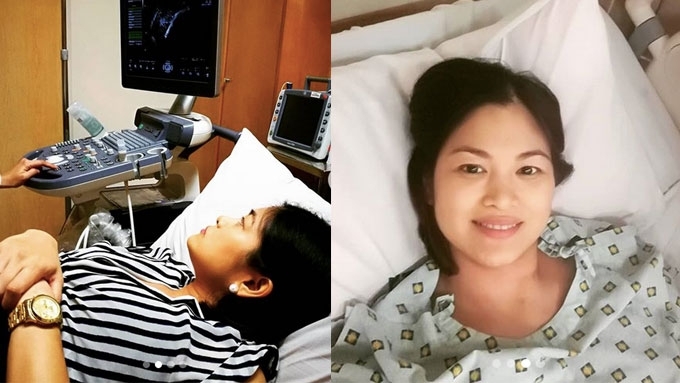 Miriam Quiambao is set to give birth to her son Elijah any time now. Three hours ago, her husband Ardy Roberto's Instagram post was, "...They will do emergency CS na now Pls pray for us!" "Hello!! AFter ultrasound, ob said she has to deliver na now!! No more amniotic fluid daw. Woo. Here we go. "Miriam Quiambao [as sender] Family, please pray for us, they will do emergency CS na tonight! Pls pray for us!!" The former beauty queen has been in the hospital since Monday, February 11. After her Doppler test/ultrasound that day, Ardy said, "...they didn't let her go home na." In a separate post, Miriam said, "It turns out that my cervix is at 1cm already and 0.99cm short at only 34 weeks!" Since her check-up last February 7, the couple have prepared themselves for the possibility of having a premature baby. Miriam's post on February 10: "The Perinatologist says my placenta is still thickened and getting 'older' and calcified. This means that it’s getting harder and further obstructing blood flow of nutrition and oxygen of the baby. "As a result, the baby is still small for his age, and is about two weeks behind in terms of growth." Ardy's post on February 11: "They'll try to keep baby Elijah inside her for a few more days so that his lungs are more stable. "But good news is that prayers have been answered and contractions have stopped for now. There is also no more 'brain sparing' so that means baby Elijah is getting the oxygen, blood and nutrients that his brain and body needs." February 14: They celebrated Valentine's Day at the hospital. "She gave us a brief summary of the female anatomy and what happens during labor so that we know what to expect. Swipe left for a sample of the Lamaze breathing techniques I learned to manage the pain of childbirth..."
Ardy's post on the early morning of February 16: "Grateful to God that our OB @dr.beckysingson gave me permission to take Miriam away from her bed rest to go for a wheel chair joy ride and get some sun. "My preggy pretty wifey has been cooped up in her hospital room for five nights already and complained of cabin fever." Miriam is 35 weeks pregnant.